of adaptability and ﬂexibility will be central to their career pathways.” The senior educator says cutting edge technology has not only given students new dimensions to explore, it has also enabled great strides forward in the way classes are run and the ability of teachers to keep track of students’ individual progress. “Technology frees the teacher from handling 25 students at once and allows a more personalised approach so students are learning at their point of need,” he says. Geelong College media students setting up to capture time lapse footage of Arts Week. 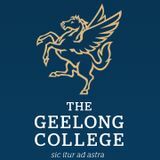 “I tackle challenges in my own way.” Geelong College, a leading Victorian day and boarding school. Improving student learning A leader in girls’ education since 1890, Korowa is renowned for its academic excellence. As part of the University of Melbourne Network of Schools (UMNOS), we are collaboratively determining strategies to improve student learning. Whether it’s 360-degree feedback for our teachers’ professional development, real-time reporting or our small and supportive classes, our students and their learning experience are at the centre of everything we do. 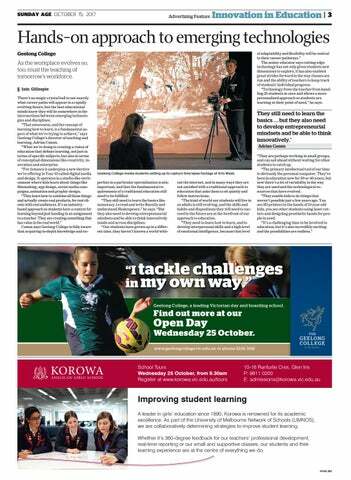 Adrian Camm, Director of CLRI speaks to the Age about innovation in education.